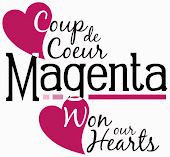 Magenta: Celebrate: Valentine's Day - La Saint-Valentin! Celebrate: Valentine's Day - La Saint-Valentin! The day that celebrates all things love. Today, our design team brings you some Valentine's inspiration to spread some crafty love.